Poplar Grove Airmotive operates a 20,000+ sq.ft. 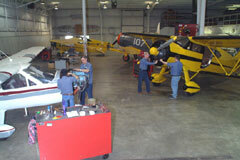 facility that houses our Airframe Shop, Engine Shop and Accessory Shop. Since our customers operate everything from modern corporate aircraft to rare, vintage aircraft, our craftsmen have a wide variety of skills to handle most any job. Many of our technicians are also pilots and aircraft owners, which helps them better understand your special needs. Our airframe shop is equipped to handle anything from a simple oil change to major inspections and repairs. Along with the metal working skills required in airframe shops today, our staff is very knowledgeable and current with the skills demanded by antique and vintage aircraft. Our ability to handle airframe, engine and accessory work “in house” makes us a great choice to handle all your maintenance needs. Our engine shop’s success is based on a very simple principal. We provide a solid, factory new limit overhaul at a reasonable price and with an average turn around time of 2 1/2 to 3 weeks. We don’t use goofy ads or high-tech sounding “techniques” to attract business or justify inflated pricing. Instead, we concentrate on precision work and rigid quality control, which allows us to deliver our customers a safe, reliable overhauled engine at a fair and reasonable price. 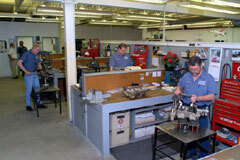 The growing demands of our engine shop led to the formation of our accessory overhaul shop. Now, we supply accessory overhaul services to a growing number of operators and engine shops around the country. Numerous models of starters, alternators and magnetos are in our growing list of capabilities. When it’s time for accessory overhauls, just give us a call. You (and your budget) will be glad you did! We stock factory OEM overhauled and rebuilt carburetors for exchange. When you’re in the need of replacement parts, components or hard to find parts, look to Poplar Grove Airmotive. Our extensive inventory and knowledgeable staff can assist you in your needs whether it be airframe or engine parts. We offer UPS shipments until 5:00 PM daily. 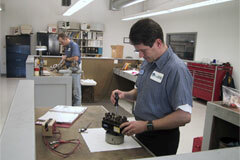 Visit our Parts Department Page for a list of our new and serviceable parts inventory.